The Knock Out Artist is coming to town. 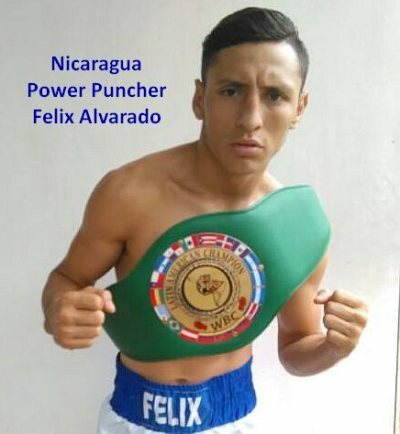 IBF #1 Felix Alvarado (33-2, 29 KOs) of Nicaragua is set to arrive in the Philippines this coming Monday October 22 ahead of his important clash against Filipino Randy Petalcorin (29-2-1, 22 KOs) for the vacant IBF Jr. Flyweight World Title at the plush Solaire Resort & Casino in Parañaque, Metro Manila, a tough fight that both men want so much to win. Alvarado's flight - KLM Flight # KL 807 from Taipei to Manila - is scheduled to land at Ninoy Aquino International Airport Terminal 3 October 22 at 6:45 PM. The dangerous 29 year-old Nicaraguan - a former two-time world-title challenger - is coming to the Philippines together with his boxing team made of Luis Ernesto Cortez, Wilmer Hernández, and Pablo Osuna, all Nicaraguan men of boxing. Luis Ernesto Cortez, 73, is a veteran, well-respected cornerman who during the 70's worked for a long time in the corner of Nicaraguan legend Alexis Arguello. He has been with Alvarado since the fighter was a kid, and knows him well. That's why Alvarado feels perfectly comfortable with Cortez. He is without a doubt a much-appreciated, experienced, knowledgeable cornerman. Wilmer Hernández, 35, is a head coach as well as conditioning coach; and will be the chief second for Alvarado. Hernández has worked in the corner of former world champions Roman "Chocolatito" González and in the corner of reigning WBC Flyweight Champion Crístofer Rosales. Pablo Osuna, 39 is Alvarado's promoter. Osuna is a former boxer in Nicaragua. He fought only five times as professional super lightweight from 2011 to 2013. Now Osuna is the promoter of Nica Boxing, a Nicaraguan promotional company that supports Alvarado. Alvarez’ manager, William Ramírez of WRAM Boxing, might not come come to the Philippines. The Randy Petalcorin vs Felix Alvarado fight for the IBF Jr. Flyweight world title October 29 is a co-production of award winning promoter Jim Claude Manangquil of SANMAN Promotions in association with Peter Maniatis Events. ESPN 5 Philippines will televise.